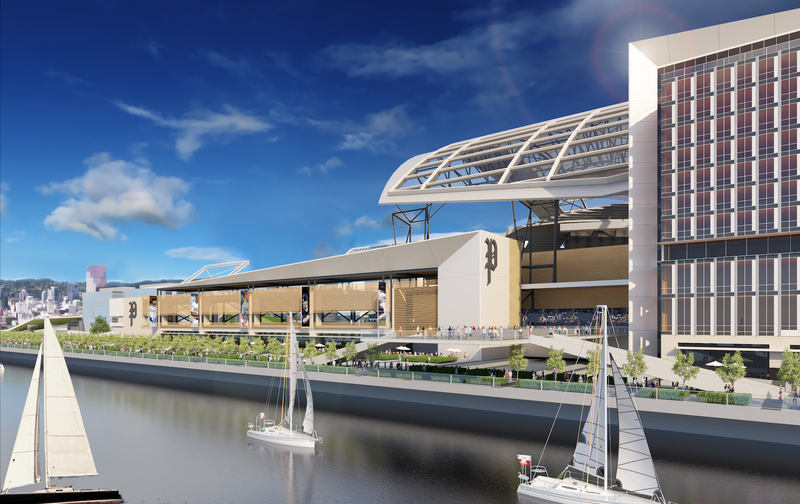 The Portland Diamond Project has proposed an MLB stadium on the banks of the Willamette. The Portland Diamond Project has an agreement with the Port of Portland to build an MLB stadium on the Terminal 2 site, reports the Oregonian. The paper also reported that Mayor Wheeler said the city “wouldn’t pay for a stadium or buy a team” but could “absorb some costs related to transportation and other infrastructure such as utility service”, and looked into what we know (and don’t know) about the proposal. BikePortland looked at the access issues around the proposed riverfront stadium. The Portland Business Journal asked its readers what they think about the stadium. The Business Tribune reported on Nesika Illahee (formerly known as Holman 42), which includes units reserved for members of federally recognized tribes. The Portland Business Journal wrote about how the Nature Conservancy is “sprucing up its Oregon headquarters with tons of timber“. 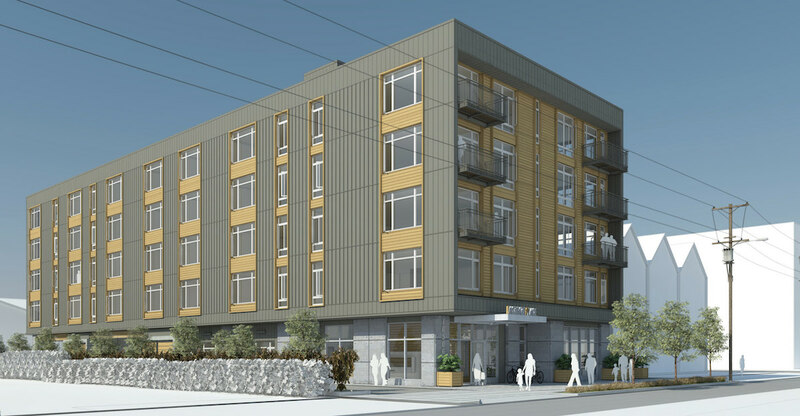 TMT Development, best know its development of downtown high rises, has completed The Marilyn at 2310 SE Hawthorne Blvd. The Daily Journal of Commerce published photos of the 59-unit mixed use building. 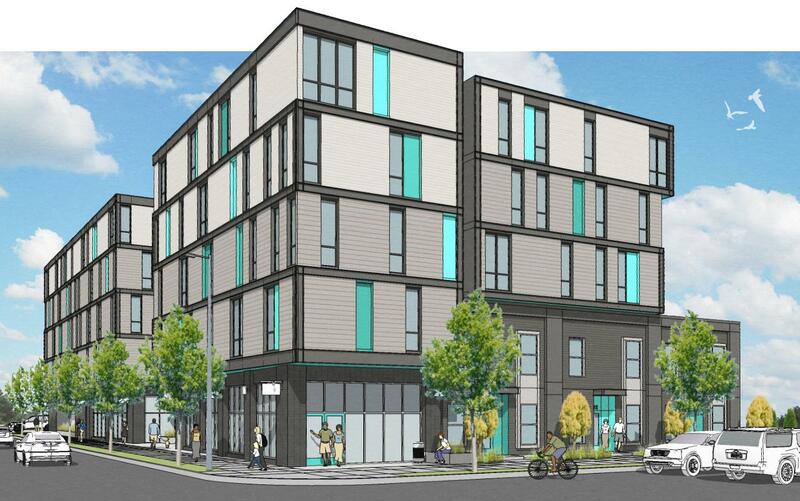 The Oregonian reports that the City Council declined to block the affordable housing development proposed at 1727 NW Hoyt St. The Oregonian looked at whether the site under the Broadway Bridge is too contaminated for the Oregon Harbor of Hope shelter. The 5020 Condos are an affordable home ownership project by Proud Ground and Habitat for Humanity. 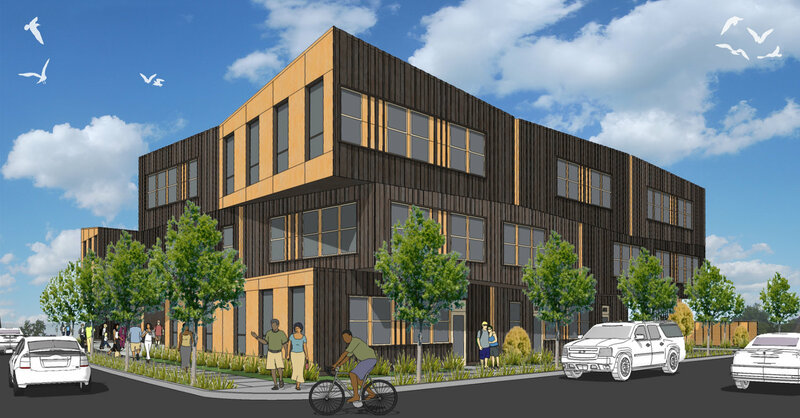 The building is proposed for a site on N Interstate Ave owned by the Portland Housing Bureau. Every week, the Bureau of Development Services publishes lists of Early Assistance applications, Land Use Reviews and Building Permits processed in the previous week. We publish the highlights. This post covers June 4th to June 10th, 2018. Construct new three story, 18 unit apartment or condominimum building on corner site in RHd zone to meet Community Design Standards 33.218.140. Bay windows overhang right-of-way. New construction of 11 story Hyatt Place hotel with a FAR of 9:1 to be achieved through transfer of 3:1 FAR from the nearby historic landmark site. The site zoned EXd and is located within the CC Plan District. Request for early assistance meeting for informaton on new construction of automobile showroom with three story parking garage. Proposal is new construction for senior housing of at least 80-90 units with parking, outdoor amenities and landscaping. Housing Bureau Project. Proposal is for the new construction of a five-story, 55,788 square foot affordable multi-dwelling development. The proposal will include 10 one-bedroom units; 22 two-bedroom units; 16 three-bedroom units; and three three-bedroom townhomes. First floor will include tuck-under parking. All existing structures will be removed. New construction of a new facility for worship at 5727 SE 136th Ave. The site is approx. 1.5 acres and has mixed zoning the eastern portion is CM1 and the western portion is R5a. Design advice to discuss renovations to the façade of the existing Macy’s. New retail entries would be created on SW 5th and SW 6th Avenues and updates to the SW Alder façade. The scope of the project includes tenant improvements from the basement to the fifth floor. This work includes interior demolition of floors one through five. Two new market-rate apartment buildings (5 story over 1). New construction of two 3-story self storage buildings with associated parking, utilities and landscape. At least one of the existing two buildings will be demolished. New 4-story apartment building (89 units total). Please note – there is already an existing building permit for the project, but he wants to add the affordable housing aspect to forgo the parking requirement. See CO 17-112446. If he finds he can proceed with the project as proposed for this EA, he will cancel the previously applied-for CO permit and get a new one, with the parking removed. New 4-story apartment building (54 units total). Please note – there is already an existing building permit for the project, but he wants to add the affordable housing aspect to forgo the parking requirement. See CO 16-171002. If he finds he can proceed with the project as proposed for this EA, he will cancel the previously applied-for CO permit and get a new one, with the parking removed. General restoration of building. New storefront and addition of 1,000 sf penthouse. Proposal is the reuse and rehabilitation of the historic Chamberlain Hotel. The proposed development will consist of 57 hotel units to be integrated with a 14 story mixed-use bldg to be built on the asphalt parking lots to the west and southwest.A connection between the two hotel areas is provided through a shared courtyard located mid-block off se stark . New construction of 3 story 4plex and site improvements.